Long haul trucking is not a job for everyone, but for Brian (à Joe) Comeau, it’s in his blood. A welder by trade, Brian’s dream was to own his own truck as a long haul driver. After sustaining an injury in December 2014, Mr. Comeau was unable to do any sort of physical activity for 5 months. During that time, he decided that it was his time to make his dream into a reality and began the process of becoming an owner-operator of his own trucking company he appropriately named French Shore Trucking Ltd. located in the heart of Saulnierville. He sought financial assistance from the Digby-Clare CBDC to purchase his first truck. Just like every business, the trucking industry has its challenges. Within the first month in operation, his truck had multiple mechanical failures and was down for 3 weeks. To avoid a situation such as this, Mr. Comeau advises to do extensive research when it comes to purchasing equipment to ensure you are getting something of quality at a reasonable investment. In his second year of business, he took the risk and purchased another truck and hired a second driver. He quickly realized that this was not the best decision, as his overhead costs were too high to maintain both vehicles and to pay wages. Selling the second vehicle enabled his business to profit at a much better rate. While speaking with Brian, it was clear that he also puts great value into establishing goals. Once in business, one of his goals was to own a Peterbilt Truck. 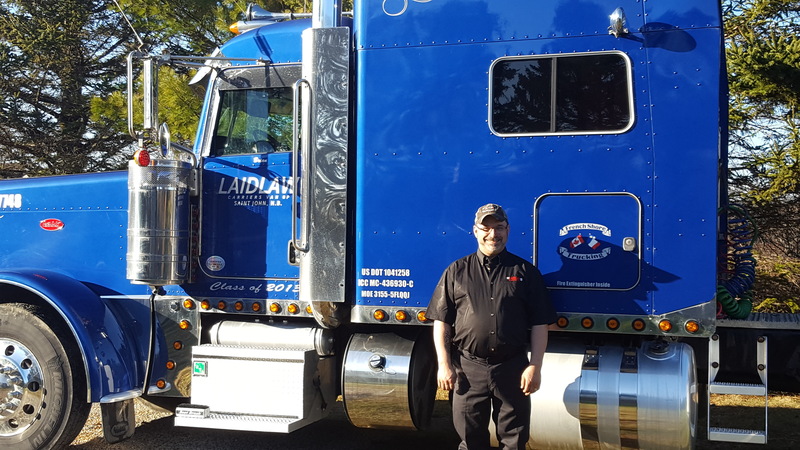 With time, after selling his Volvo and paying off his First Time Entrepreneur Loan with the Digby-Clare CBDC, Brian attained his goal and purchased his dream vehicle to conduct his work. In five years’ time, he would like to purchase a brand new vehicle that would allow the business to profit even more, as it will have better fuel mileage and less maintenance and repairs.